Two foreign policy Ministers speaking out on the vote on November the 29th 2012 in the United Nations on upgrading the status of Palestine in the UN. The United States voted Against with 8 other states and The Netherlands was one of the 41 abstention states that did vote neither ‘for’ nor ‘against’, still favouring a new Palestinian state, but along another trajectory. In the end 138 of the 193 states of the United Nations were voting ‘for’ the proposal. Palestine President Abbas called it “the birth certificate of the reality of the state of Palestine”. 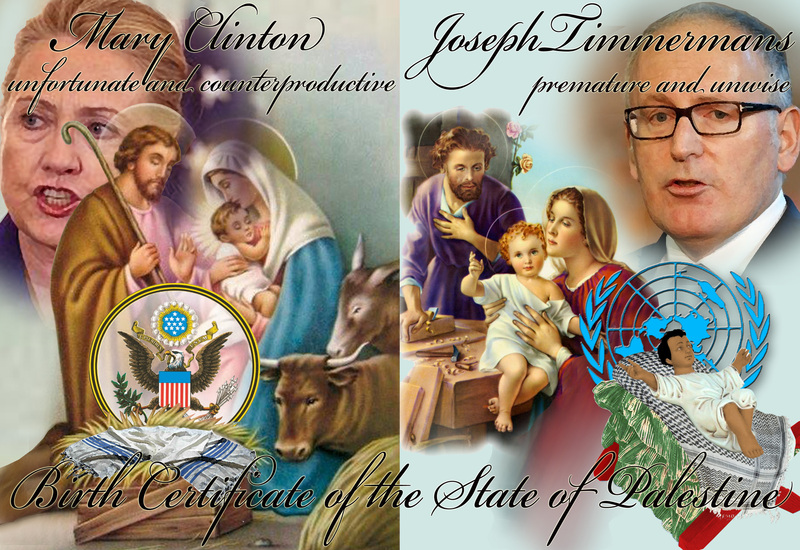 The name of the (new) Dutch Minister of Foreign Affairs ‘Timermans’ means ‘carpenter’ in Dutch, and thus my association with the Biblical scenes of ‘Joseph the Carpenter’ who has ‘no voice’ in the scriptures, but is believed to be the one who changes the feeding ‘crib’ in the stable where the Blessed Virgin Mary delivered the Child of God, into a ‘cradle’ for the the new born Son of God. Palestine, the ‘land of milk and honey’, symbolised by a crib to both feed live-stock and as a warm comfortable nest for a new born to be laid down on a cloth covering the straw: either a Jewish ‘tallit’ (Hebrew: טַלִּית) or a Palestinian ‘kufiya’ (Arabic: كوفية). Metaphorical questions arise from this imagery. One crib for two infants? Two separate cribs, or a Judgement of Solomon whereby Joseph the Carpenter will be asked to take his saw and split the crib into two? There are other possible readings. Is the Holy Infant single or multiple? If more than one, are they twins, Siamese twins? In the case of twins is there an oldest one, having ‘oldest rights’? The Israeli ambassador at the United Nations Ron Prosor made an absurd historical claim in his speech: “No decision of the United Nations can break the 4000 year old bond between the people of Israel and the land of Israel”, trying to overbid his Palestinian competitor. You need to be a true believer to be convinced that virgins can deliver babies. Still, many Christians, do accept the complicated concept of the ‘immaculate conception’ of Maria herself by her mother and father Saint Joachim and Saint Anne. It rendered her “forever free of sin“ preparing her for the ‘incarnation’ of God in the human form of Jesus Christ. Becoming a mother that remained a virgin. “And the angel said unto her, Fear not, Mary: for thou hast found favour with God. And, behold, thou shalt conceive in thy womb, and bring forth a son, and shalt call his name Jesus. There is a strong association with the long raging clerical debate about the ‘immaculate conception’ of Maria and the ‘incarnation of God’ and the tormented way in which these two “new nations” Palestine and Israel were conceived and fail to establish themselves. They are young national states, each with their own claim of an ancient origin. Their concepts are not so much about what exists already and what could happen from there in real life, but more about believe systems based on an imagined past. Concepts of such ‘imagined communities’ (1) are hardened by differing and warring schools of religious leaders, politicians, archeologists, linguists, historians, lawyers, geographers and anthropologists. All of them massage and shape “their facts” to let them fit “their own view” of “their own promised land”, mostly neglecting the existing reality of other populations and settlements. The voting on November the 29th in the UN came 65 years after the proposed partition, of what was then the British Protectorate of Palestine, into two states, one of them Israel. Two years later in 1949 Israel became the 59th member state of the United Nations. At that time the Soviet Union was one of the Great Powers that supported the creation of this new state. There was a lot of opposition and dissatisfaction though from Palestinians, finding themselves -in practice – excluded and expelled. All neighbouring Arab states were against the partition as such, or details of how territory was supposed to be cut up. A whole series of violent clashes, over territory and control, delayed the forming of a Palestinian State, that was finally proclaimed in the year 1988. Pro-Palestine votes were 90 from the then 159 member states of the United Nations in that year. 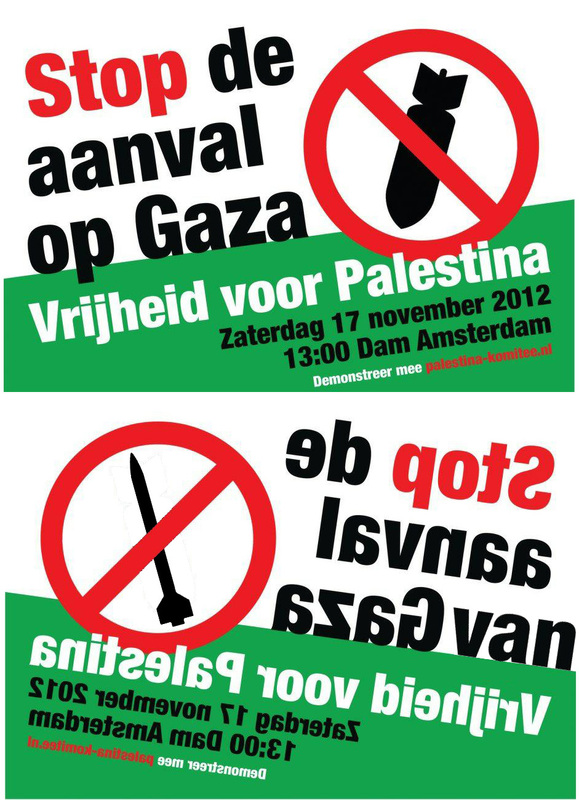 To use – 24 years later – the word “premature” for a vote on further acknowledging the rights of Palestinians to their own independent state, is best expressed with the Jidish/Dutch word ‘gotspe’, ‘chtuzpah’ in English usage, meaning an ‘aggressive boldness or unmitigated effrontery’. Curiously Timmermans, before he accepted the job as Minister of Foreign Affairs in the new Dutch Government formed in autumn this year, has been actively pledging for a pro-Palestinian position in the Dutch parliament and also on the level of the European Union. He has extensively explained away his change of policy with lots of diplomatic finery, but for most voters on his party the social-democrat PvdA, it simply meant a betrayal of principles. There are now 131 from 193 UN member states that voted for the upgrading of Palestine position toward a ‘de facto’ independent state. Against were 9 states with Canada, the Czech Republic, Panama, The USA and a series of small USA vassal states in the Pacific. From the 41 states that chose to abstain from voting there was a big contingent from the European Union. The European Union is now split in two camps when it comes to the tactical view on how to favour a peace process in the Middle East with these ‘twins’ that do not want to fit in the same crib. In favour: Austria, Belgium, Denmark, Cyprus, Finland, France, Greece, Ireland, Italy, Luxembourg, Malta, Portugal, Spain, Sweden. Abstentions: Bulgaria, Estonia, Germany, Hungary, Latvia, Lithuania, Netherlands, Poland, Romania, Slovakia, Slovenia and the United Kingdom. It should be noted that two world powers, other than the United States, China and the Russian Federation, have voted pro-Palestine. How “unfortunate and counterproductive” the merely symbolic vote for the new Palestine state will be, will not only be determined by the State of Israel. The first reactions of the big loss of support for Israel in the UN were immediately followed by the usual Israeli accusations of “lies” being told by the President of Palestine, and punishing measures: expansion of Israeli settlements on occupied Palestinian land, freezing of tax and other assets in Israel belonging to the Palestinian Authority. A signal has been given now by the majority of members of the United Nations, that they want to see an end to what has become known as ‘the endless conflict’. It is a signal, not so much to ‘the old warrior guard’ that is leading Israel on the path of ‘no solution’ expressed by the continuous state of ‘low-intensity and asymmetrical war’ with an imprisoned neighbour, but to the Israeli population at large. Time for Israelis to think up a non-military vision of the future. Time for a new generation of politicians. Politicians that have to differentiate themselves fundamentally from all those who have failed in the past, decade after decade. Time to stop coming up with solutions that generate even more problems, with ‘the wall’ as one of the most obvious examples. Time to reflect on the failures within Israel itself with rampant inequalities and discrimination. 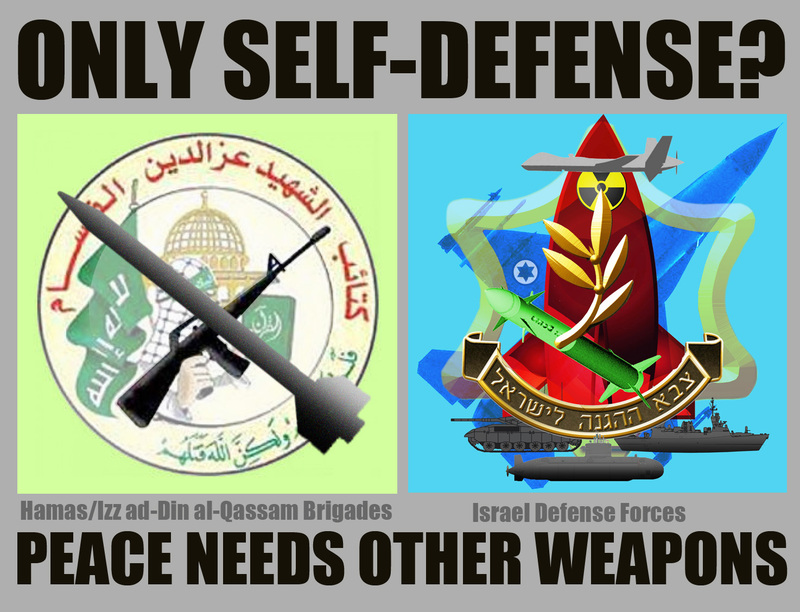 “The Israel Defense Forces (IDF) – Tzahal likes to use quotes from the Scriptures to name their operations. Those familiar with the Scripture would easily understand the meaning of the name “Pillar of Cloud.” According to the book of Exodus, God himself appeared in the form of a pillar of cloud before Jews and accompanied them during their wandering in the desert. Hamas does the same Its latest war against Israel was called “Stones of Baked Clay.” According to the Qur’an, Allah turned the Ethiopian army who invaded Mecca into dust with such stones. 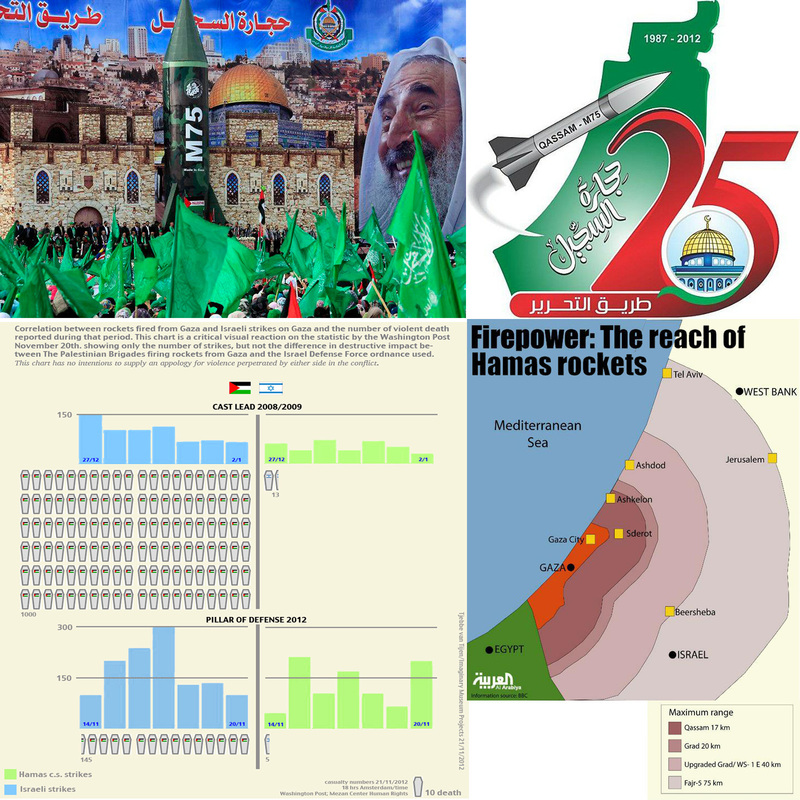 Perhaps, Islamists think of their missiles that hit Israel towns as such “stones of baked clay.” This slogan appears on the new logo of Hamas made for their celebration of their 25th birthday as an organisation (lets remember how Israel intelligence forces have had a hand in the creation of Hamas as a method to split up Al Fatah). The statistics of the relation between number of attacks and casualties on both sides in the conflict is to show how the concept of ‘asymmetrical warfare’ should be understood. A military defeat by the superior forces of Israel, nevertheless, was celebrated as a victory in Gaza City by Hamas with a triumphal parade and a huge stage where the exiled leader of Hamas, Khaled Meshaal, presented himself in front of a stage mockup copy of a long range rocket that is claimed to have been build inside Gaza and is named after it’s range of 75 kilometers. A few these rockets which seem to be based on the Iranian Fajr rockets, have been fired into Israel last November, One landing outside Tel Aviv and another landing in the fields outside of Jerusalem. Note the stage design in Gaza City with a replica of the Wall in Jerusalem and the Al-Aqsa Mosque. The same mosque that appears in the Hamas logo. Time for the Palestinians and their warying camps, to reflect on the failure of decades of militant and military strategies and tactics. Time to go beyond glorifying martyrdom and presenting defeats as victories. Time to allow those Palestinians, who have another vision, at least a voice. To overcome also the repressive violence within the own Gaza and West Bank territories by its own authorities and power groups. Time – as well – for all those supporters of the Palestinian cause, not to cast a blind eye on the internal and external violence perpetrated, by the leading Palestinian authorities and powers. Time for outsiders to use their special position as outsiders, to go beyond the usual single partisan support and extend it to those in the Israeli camp who seek other than military solutions. (3) Time to recognize that a balance of ‘means’ and ‘ends’ is needed, that drones, jets, rockets and missiles will only bring disaster from whatever camp and for whatever purpose they are fired. There are NO ‘immaculate states’ in the world, the foundation of each of them has be done to the detriment of those who were discriminated, excluded, expelled, or massacred. The land that forms the body of a state is hardly ever ‘virgin land’ and most states are not ‘new born’ but ‘reborn’: conquered, recaptured, assembled into empires, associated, federated, divided and redivided. Whence we overcome the shortsightedness of ‘nationalism’ and use real historical perspective we must admit that man is a migratory being and any state in the world proves to be – in the long run – a temporary entity – in spite of a-historical claims of millennia of state-continuity like certain Imperial China and State Zionist, and Inca-Empire reconstruction advocates claim. Three maps showing partition plans for the Middle East region from the breaking up of the Ottoman Empire and confiscation by Western allied powers in 1916, at first with France, Great Britain, Italy and Russia, the last one falling out because of the turmoil of the Russian Revolution in 1917. The Brits getting Palestine as a protectorate and the subsequent carving up of territories into new – dependent – states, with one of the many maps showing a carving up proposal, between the new states of Israel and Palestine, dating from 1946. These are just three maps of a few thousand, each with their own reason of being drawn. As maps do represent always some kind of intend. There are no objective maps, let alone objective maps that treat history from different viewpoints in an equal way. 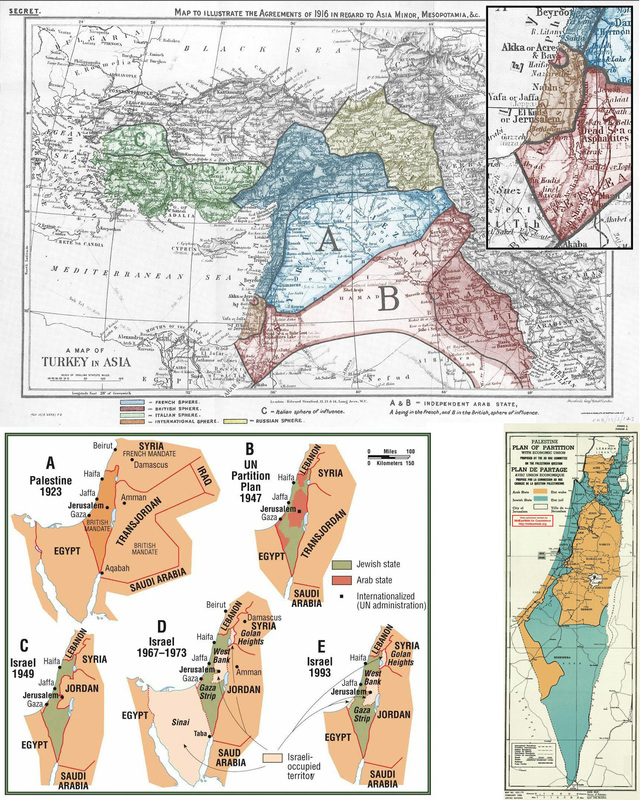 When one reads through the thousands of partisan web pages pro/contra Israel, pro/contra Palestine now-a-days one always will see some maps coming up and people trying to make their point, or dismiss someone’s argument, all because of a certain map being reproduced. My idea of an Interactive Digital Atlas of all those maps would be hardly possible to make, its editorial committee would fail within a short time, accusations and denunciations would take up all of the time before real work even could have been started. When we imagine an interactive map of the Middle East showing in layers all the complexities of ethnicity, religion, kingdoms, empires, states, colonies, protectorates, special zones and so on, it will become clear, that choosing any specific historical layer as a model for a future redivision of territory, will produce a chain-reaction of new problems and new violence. (3) Recent examples galore: the split up of India, Pakistan and Bangladesh, the ethnic cleansing between by Greece, Bulgaria and Turkey, the reemergence of the Balkan conflict, such an overview would be too long a list for this article. The crib of of Palestine will thus need to be adjusted to give equal place to the two infants. A readjustment not in one big violent reshuffle, but in a constant series of smaller changes, allowing the by now elderly infant-states to accommodate themselves as good as possible in this cramped space. Re-inhabiting and re-distributing the land and in this process finding more space by breaking down both physical barriers and mental borders. Can we allow ourselves to see the United Nations as the ‘Holy Family’ that will be so ‘wise’ and ‘fortunate’ to find ways to assist this process? (1) Benedict Anderson “Imagined Communities – reflection on the origin and spread of nationalism‘; first published in 1983 (the link is for an extended edition published in 2006). (3) List of Arab-Israeli peace projects on Wikipedia.